Although the process for requesting a temporary order of visitation varies among states, you can make the request on the divorce petition, or on the answer, if your spouse filed. You can also make the request by submitting a motion shortly after filing for divorce. Typically, the court holds a hearing on the matter within a few days or weeks of the court receiving the request. Usually, the judge in your divorce case presides over the hearing and decides the issue, along with any other temporary order requests. If you don't want to leave this decision up to the court, you and your spouse can draft your own agreement and submit it to the court for review. If the terms are satisfactory and the court approves the agreement, it will become your temporary visitation order and will remain in effect for the duration of the divorce proceedings. The first step in determining custody and visitation -- whether it is temporary or permanent -- begins with the court establishing legal and physical custody. Legal custody is a parent's right to make important decisions about a child's upbringing, such as schooling, religious ideology and medical treatment. 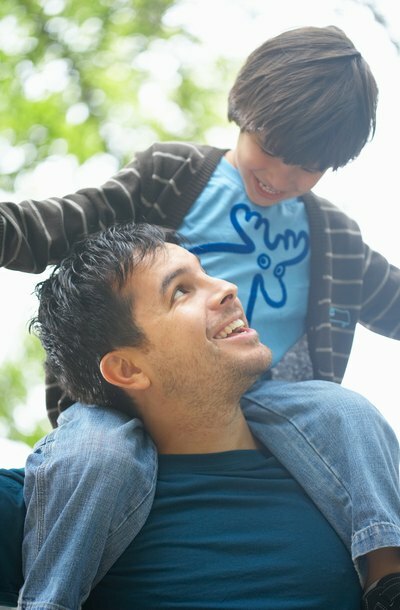 Often, courts will award legal custody to both parents. However, if parents do not have an amicable relationship, the court may award this responsibility to one parent. Physical custody represents the parental home where a child lives. Typically, courts award physical custody to one parent and visitation rights to the other parent, who usually pays child support. Although you may only be interested in visitation during the divorce, it is important to keep in mind that courts often maintain the pre-existing custody and visitation arrangement when the court issues the permanent order. Therefore, if you want sole or shared physical custody of your child after the divorce, you may wish to ask for this -- rather than visitation -- in your temporary order. Courts do not automatically grant custody or visitation simply because a parent asks for it. When evaluating your request for temporary visitation, the court will decide whether visitation is in your child's best interests and it will determine whether your spouse is the best parent to have physical custody of your child. To make this decision, the court will evaluate a variety of factors. Although laws vary among states, courts tend to look at the same things when awarding custody and visitation such as the following: The wishes of the child and parents; the relationship between the child and each parent; the child's adjustment to home, school and community; the physical and mental health of all parties; and whether there is a history of domestic violence or substance abuse. For example, if the court determines you are an unfit parent because of a history of domestic violence, the court may deny your request for visitation or it may limit you to supervised visits only. Once the court approves your temporary visitation order, it becomes a legally enforceable court order. This means you can return to court and have the order enforced if your spouse refuses to comply with its terms. The court may hold your spouse in contempt of court, which may result in fines, or the court may change the custody and visitation arrangement. For example, if your spouse prevents you from visiting your child, the court may turn over temporary physical custody to you and possibly award you permanent physical custody in the divorce decree.